Sunspots or solar keratoses are areas of skin that have been damaged by the sun. The area might be a single spot, or it might be an area of damage. The damage can vary in depth. If the damage continues down to the full thickness of the top layer of the skin (the epidermis) it is then classified as an intraepidermal carcinoma. 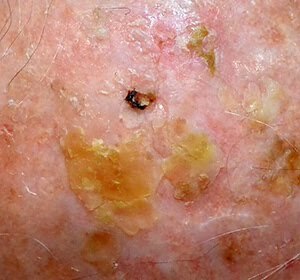 If the damage extends beyond the full thickness of the epidermis, the lesion is classified as a squamous cell carcinoma. Small and superficial sunspots can be easily treated by cryotherapy or freezing the superficial layers of the skin. As sunspots become deeper, cryotherapy needs to be deeper, and treatment becomes more likely to scar and more likely to fail. As sunspots become larger or more spread out, they also become more difficult to treat by cryotherapy. Large and deep sunspots can be more suitably treated with creams, which generally cause less scarring. These creams include efudix, picato, aldara and PDT. Fig 1. Small solitary sunspot showing mild keratosis and mild inflammation. Fig 2. 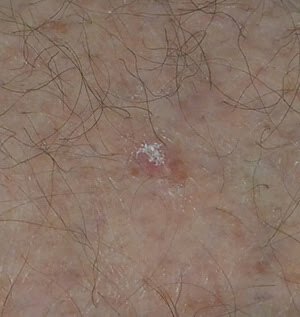 Area of solar keratosis showing hyperkeratosis and inflammation.